To RCJ Higashi-Sendai Church Council, RCJ TOHOKU Presbytery Mission Committee, RCJ Shikoku Mission Cooperation Committee, Mission Coalition Committee, Mission Japan Committee and RCJ Tokushima Church Council. The period since we left South Africa on the other side of the globe on Wednesday morning 4 September, travelled about 30 hours, arriving and being in Sendai disaster area until Sunday 13 October, has been a busy and a very-very eventful and to us personally a very special and a truly blessed time. Our visit in TOHOKU (North Eastern Japan) was, as in the past, officially arranged as a JOINT PROJECT of RCJ SHIKOKU Presbytery Mission Cooperation Committee and Mission Japan Committee. This was done in consultation with RCJ Tohoku Presbytery Mission Committee. All expenses were covered by offerings from congregations in RCJ Shikoku Presbytery and from the budget of Mission Japan. 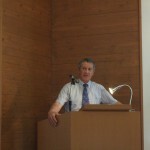 We did not incur any expenses on the congregations of RCJ Tohoku Presbytery. We arrived on Thursday evening (5 September) at NARITA airport in TOKYO. TAKA ASHIDA sensei and his wife, JUNKO san, welcomed us and took us by car all the way to SENDAI. The next day I attended, together with Ashida sensei, the MISSION COALITION MEETING at Sendai Church. It was very good to see the people with whom we worked from the beginning and to hear the reports on the work. As in previous times, we stayed in a furnished cabin at TAKAYAMA Missionary Summer Resort (Shichi-ga-Hama City near Sendai). Stephan and Carina and their children were already at Takayama for their annual vacation. They stayed in a nearby cabin. The first two weeks we could see them regularly. 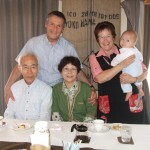 David and Noriko Lauer kindly made their vehicle available for our use during the whole period of our stay in Tohoku. We worked under the supervision and guidance of RCJ Higashi-Sendai congregation and their pastor, AKIRA TATEISHI sensei. Our weekly schedule was arranged in consultation with Akira TATEISHI sensei and his staff member, Noriko Lauer. Our Sunday preaching appointments, however, were arranged by elder Kazuo SASAKI of RCJ Sendai congregation. The first week, after arriving in Japan, we suffered from very bad jetlag and had to carry-on with little sleep… Then, very suddenly Stephan had to return to SA to visit his father who had an emergency heart operation. For a couple of days we had to assist Carina in her pregnancy and help take care of the children. In the middle of our stay Annalie caught a very bad cold (flu? ), she felt very bad and stayed one whole day in bed. It took her two week to recover fully. Fortunately I didn’t catch it…! The main focus of our weekly ministry was the work of RCJ Higashi-Sendai congregation in the HIGASHI-MATSUSHIMA area (NOBIRU Town and TOUNA Town). We participated in the weekly SAKURA CAFÉ, the KASETSU (Temporary Housing) luncheons, an ONSEN (hot-spring) tour with tsunami victims, a NIJIIRO PTA dinner, etc. We visited some people in the disaster area with whom we became acquainted during our previous visits. We had several opportunities to spend time with individuals, listen to their stories and show compassion…. One Saturday we did some cleaning of SAKURA HOUSE and the yard while the staff members were away. On our last Saturday we attended NOBIRU FESTIVAL where RCJ Higashi-Sendai congregation had a food stall. Annalie again participated in the KNITTING CLUB in Shichi-ga-Hama City. She was a part of it during our previous involvement. We invite some of the ladies from the Knitting Club for lunch. We had Sakura House staff members at our cabin for dinner while Stephan and his family were still in TAKAYAMA. During our stay we had all together 18 people for dinner / lunch. We regularly attended the prayer meetings at RCJ Higashi-Sendai congregation conducted by SUDO sensei. Twice we visited NOZOMI CENTER. The first time they had a CRAFT session with ladies from the area. The next time we went to clean NOZOMI CENTER while the staff members were out on ministry. It was short but we really enjoyed great fellowship with fulltime staff member YUI HAMADA, and with elder OHNO, his wife TAMAKO, Cal Cummings (OPC missionary) and TAKASE sensei, all of them doing a wonderful ministry at Nozomi Centre. We had tea with CAL and EDIE CUMMINGS, missionaries of the ORTHODOX PRESBYTERIAN CHURCH from America. We also enjoyed having coffee and dinner with retired minister SUDO sensei and his wife TAIKO (They were the minister-couple at RCJ TOKUSHIMA congregation before we were called to Tokushima). One day we visited missionary friends who are working in Onagawa Town. Onagawa Town was completely wiped out by the tsunami. We visited the town one week after the tsunami. We were deeply shocked. These friends are living in that area and working in Onagawa where there has never been a single church…. We also visited STEPHAN & KEIKO SMITHDORF, missionaries from the Dutch Reformed Church in SA (Dispatch DRC), working with OM in TOHOKU disaster area. It was a great time of fellowship with their lovely family. We are proud of the good work they are doing in Japan! On the six Sundays we were in the RCJ Tohoku Presbytery, we visited RCJ congregations. I had the privilege to minister the WORD and we had good fellowship with the members. We could also convey the love, compassion and prayers of our churches in SA. We visited the following congregations: Higashi-Sendai, Eikou, Fukushima, Sendai, Kanan, Kitanakayama and again Higashi-Sendai congregations. We did sometimes wonder and struggle about the purpose and significance of our being for such a short term in this area…. However, we did believe that it was part of God’s plan and guidance. We just have to be obedient and faithful in our being here and in what we are doing, no matter how small and insignificant it might seem… We were encouraged by those who said that just being with the people in the disaster area is a way of bringing consolation and encouragement. We were again and again impressed with the involvement of the Christian Church in general in the disaster area. And especially with the work of the RCJ specific in Higashi-Matsushima area via SAKURA HOUSE, in Yamamoto Town via NOZOMI CENTER and in RIKUZENTAKADA through the outreaches of RCJ EIKOU congregation. We are deeply touched by the ongoing sacrificial involvement of RCJ members. They often do it from far away. They send cakes for Sakura Café and gift-parcels to people in the KASETSU. 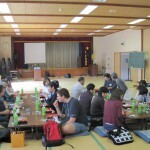 They send members to help as volunteers and to do crafts and other activities and to visit people in the KASETSU…etc. One wonderful example is elder SUZUKI of RCJ Higashi-Sendai congregation, a retired cook, who is every Thursday on duty at Sakura Café preparing delicious meals for victims of the tsunami. We are deeply impressed with and grateful for the continued financial support from RCJ congregations from all over Japan. And also from overseas Reformed Churches. These finances are running into millions and millions of YEN (Dollars and Rands)!! This is God’s doing!! And it is God’s money. And it is God’s work. This puts a very big responsibility on those who administer the funds and those who are physically involved in the ministry….. However, the funds budgeted make it possible to carry-on with this ministry at Sakura House, Nozomi Centre and Rikuzentakada Town for only another 3 years. We just cannot contemplate the effect of the suspension of a Christian ministry that is making such an impact in an area which had very little if any Christian influence before the GREAT DISASTER….. It is like preparing the soil for sowing the seed and then giving up….. Missions in Japan (and everywhere…) is LOOOONG term work…. We are deeply concerned for the spiritual and emotional wellbeing of the fulltime workers. These workers are weekly, if not daily, busy caring for tsunami victims both physically and emotionally. We fear spiritual and emotional burn-out…. We strongly believe and recommend well-planned pastoral care for them. They also need proper long term leave (not just a couple of days but a few months and/or a real sabatical). We need to arrange special spiritual retreats for them. We actually want to suggest that the RCJ and the Mission Coalition Committee send Yui HAMADA, Akira Tateishi sensei and NORIKO Lauer for a proper spiritual and emotional retreat to us in SA around March to June (South African Autumn)….. The purpose of all Christian service (ministry) is the GLORY of GOD (Matthew 5). We are chosen and sent by Jesus to bear fruit, more and more fruit, much fruit, fruit that abides, fruit whereby the FATHER will be glorified (John 15). This is the motive of those who support and give for the work. And this is the motive of all who serve concretely and directly in the frontlines. Not our own name and reputation, neither that of the church, but the NAME of the LORD. This is only possible if we serve while abiding in the TRUE VINE Jesus Christ and work in the power of the Holy Spirit. Our daily prayer should be: “Our Father in heaven, Hallowed be Your Name, Your Kingdom come, Your Will be done on earth as it is in heaven…” This should be our ongoing prayer for the Church, the workers and all work in the disaster area. Regarding any future joint projects in TOHOKU of RCJ Shikoku Presbytery with Mission Japan, we believe that the value, the purpose and the contents should be thoroughly deliberated and evaluated by all parties involved. Financially it is a very big expense for Mission Japan’s budget. The main focus of Mission Japan is in the first place the ministry of the current missionaries in Shikoku. However, if this kind of outreach is seriously considered by all parties involved as important and valuable, Mission Japan should budget for it and inform its supporters in this regard…. Ons bid so vir julle wat die nuweling betref. Ons gebed is dat Hy wat julle na Japan gestuur het sy geseende werk daar deur julle almal sal voortsit. Baie geluk met die pos by die Teologiese Fakulteit, jy doen jou van gestand, want heelwat van jou vangenote is in die Akademie. Dis ‘n opwindende tyd né! Stephan jou aanstelling is fyn beplan vir hierdie tyd; mag dit ‘n wonderlike, vrugdraende seisoen wees. Ek wag ook gretig vir nuus van julle jongste se verskyning! mag dit goed gaan! Laastens ‘n bemoediging met Watchman Nee se boodskap: You are SEATED with Christ in High Places, So you can WALK with the Spirit of the Living God and always STAND in the face of the enemy! En Almagtige God berei ‘n wonderlike Feestafel onder die neus van die vyand – to the GLORY of HIM who created all and who REIGNS FOREVER!